As of this writing (June 30th, 2017) Boulder Dash is still being played all around the world. And I believe it always will be simply because it is a game of lasting impact, it has lots of originality based on very basic but enjoyable concepts. It started its life on 8-bit Atari 800, but after that it has been ported to numerous platforms, even the modern ones. This fantastic puzzle/action game was first released by First Star Software in 1984. The primary creator, designer, programmer, graphics artist and musician was Peter Liepa although Chris Gray contributed ideas, perhaps even the original idea for the game. 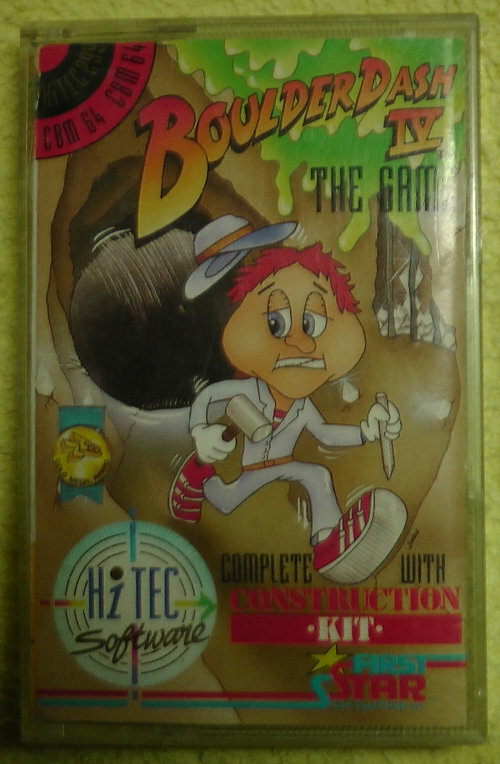 It should be noted that there exists an earlier Commodore 64 game called The Pit that may have influenced the design of Boulder Dash (The Pit was released in 1983 and was created by Bill Huberich). However, the main idea of Boulder Dash remains very original and is indeed the single greatest strength of the whole game. 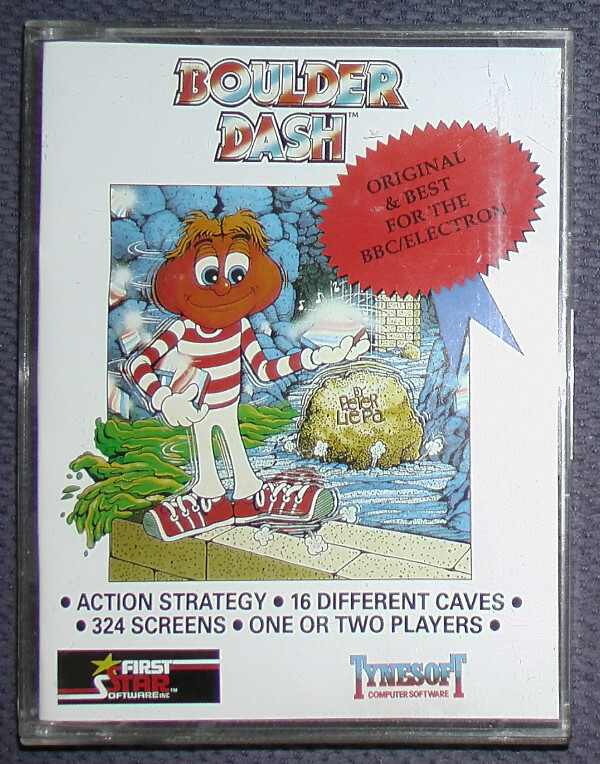 With Boulder Dash, it was never really about flashy graphics or fancy music. This is not to say that the graphics are bad. In fact they are quite good considering the limitations of the 8-bit Atari 800. The introduction tune is very good too. During the game, there is no background music but there are simple, working sound effects. What is the aim of the game? You have to collect enough diamonds while avoiding falling rocks and some simple enemies. Each cave has a time limit that must not be exceeded. That is nearly all there is to it, but Boulder Dash is more than just a game, it is almost a unique game genre of its own. I am not going to further elaborate the idea of Boulder Dash here, because that has already been done on several pages and sites. If you do not know the game, you could start by reading the Wikipedia article. Sadly it is brief, but it does contain some valuable information. Arno Weber has interviewed Peter Liepa and that interview is definitely worth reading for all Boulder Dash fans out there. It is my personal opinion that First Star Software is quite a lame company. In addition to releasing Boulder Dash, they released only a few notable games such as the Spy vs Spy (1-3) series. As far as I understand, they were never really that much involved in the creation of Boulder Dash. Peter Liepa did almost everything by himself, getting a little bit of input from Chris Gray along the way. When the game was finished and ready to be published, First Star Software got the deal and that was it. The game turned out to be very popular and First Star Software proceeded to license the porting to several 8-bit platforms such as Commodore 64, Sinclair ZX Spectrum, MSX, Amstrad and BBC Micro, to name just a few. 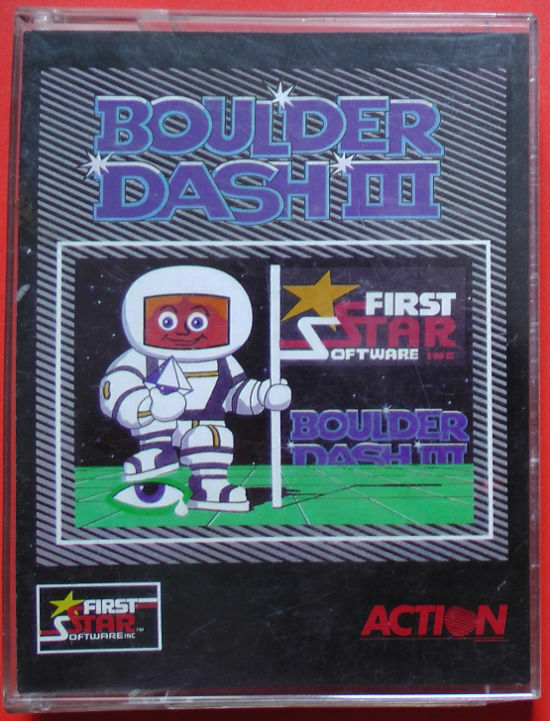 In other words, other companies and their programmers were given the permission to release Boulder Dash provided that they paid to First Star Software. So what is it that makes First Star Software lame? 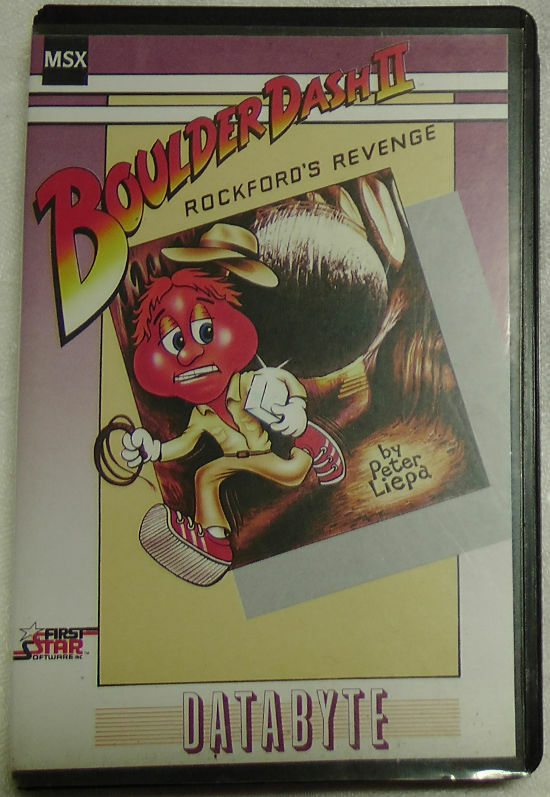 It is a known fact that the company jealously guards their "intellectual property rights" and I have heard that fans who have made Boulder Dash remakes have been told to withdraw them. 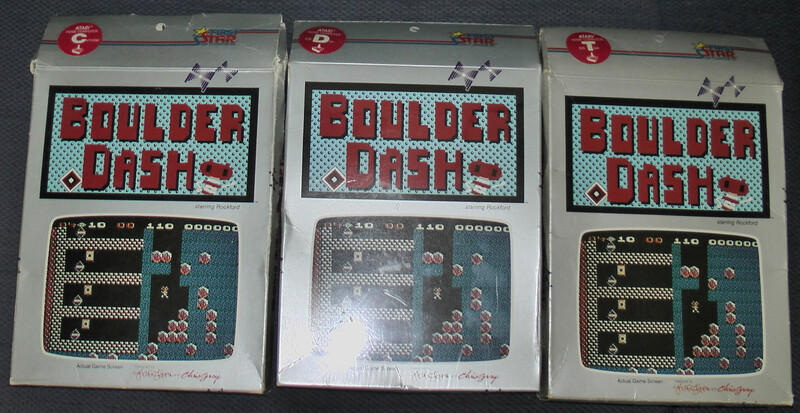 Even though the original 8-bit platforms are obsolete now, Boulder Dash still makes profits for First Star Software. As I have already said, the game has been ported to modern platforms too so the money keeps flowing in. And I happen to think that the modern ports are also very lame. Of course they have better graphics, but the playability and the feel of the 8-bit Atari 800 or Commodore 64 simply is not there. I urge you to avoid the modern ports and stick with the 8-bit originals. 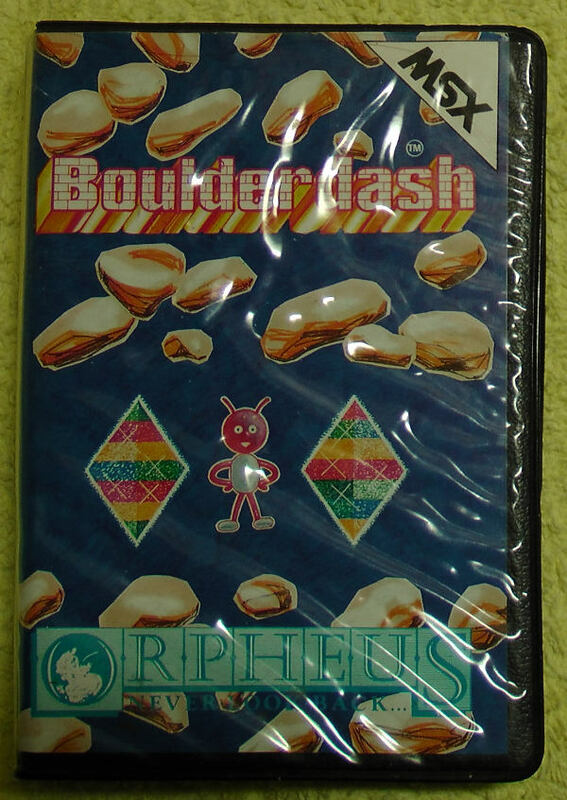 To avoid persecution, your best bet is to buy a copy of Boulder Dash on eBay. For instance, you could buy a cheap reissue tape for Commodore 64. This is not to play it on a real C64. On the contrary, the purchase guarantees that you are a lawful owner of the game, and that makes it safe for you to leech a D64 disk image to be used on a C64 emulator such as VICE. However, in all honesty, you are probably safe even without owning a legitimate copy since the 8-bit originals and ports are not making money for First Star Software any more. Whatever your decision, I recommend using Atari 800 emulation or Commodore 64 emulation. And by the way, while we are at it, I might as well give you a little hint that very few Boulder Dash players seem to know: By holding down fire-button and pointing joystick (or gamepad) up, down, right or left you can pick a diamond or dig dirt without moving Rockford. That might sometimes be handy. 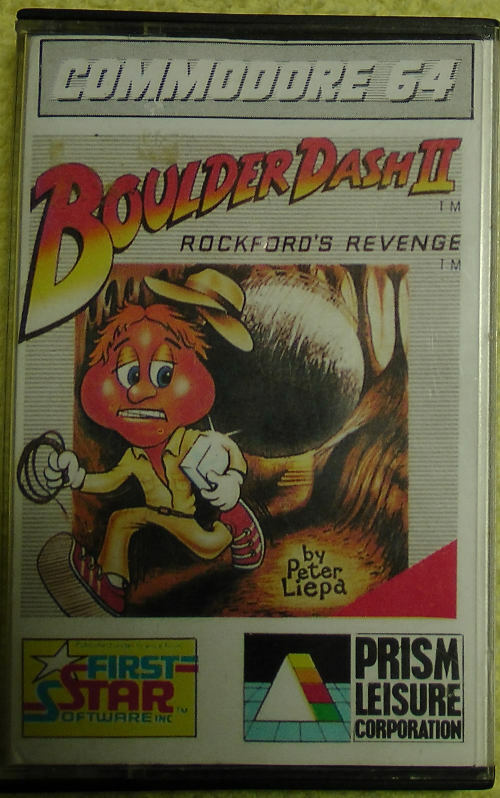 The original Boulder Dash and its sequel Boulder Dash 2 - Rockford's Revenge are fantastic. On the other hand Boulder Dash 3 looks absolutely horrible. For some braindead reason, the colourful graphics have been replaced by utterly ugly gray colours that make you want to puke. They say the playability is still there as the game engine itself has not been changed. But in my book Boulder Dash 3 looks so bad that it is better to skip it completely. Boulder Dash 4 returned to the proven graphics of the first two games and is an excellent game. 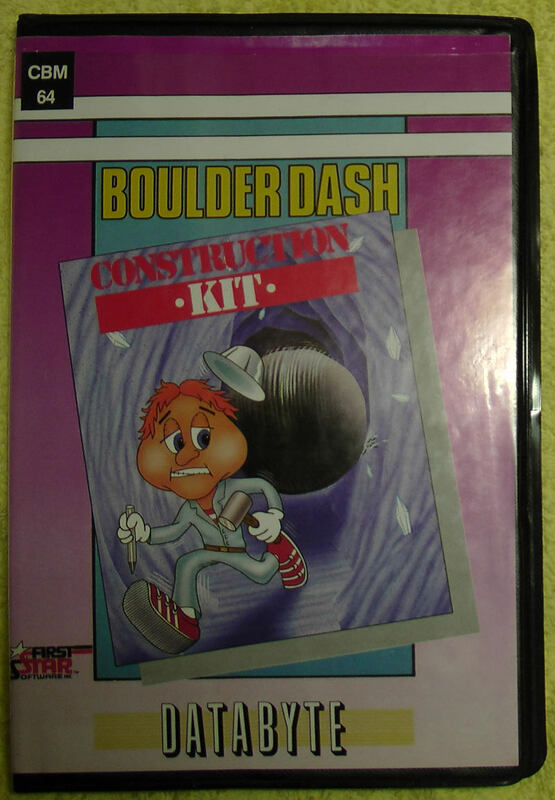 The fourth game sometimes comes up bundled with Boulder Dash Construction Kit. If you want, you can create new caves with the construction kit even nowadays. How is that possible? Well, for one thing, VICE emulator fully supports virtual 1541 disk drives and virtual floppies for Commodore 64. You can load Boulder Dash Construction Kit from one floppy disk image, and then proceed to "eject" the virtual floppy, and "insert" a blank one, and save your newly created caves on that. I am sure that method will work on all Atari 800 emulators too. I am mainly a Commodore 64 games collector, but as I have been collecting for 17 years now, my C64 collection is pretty big. I must say it is almost complete with respect to the games that I want to collect. Because of this, I have broadened my Wants-list to include all 8-bit Boulder Dash versions that were released back in the 1980s. This collecting goal is not as easy to accomplish as it may sound. Due to several 8-bit platforms, three media formats (floppy disk, tape, cartridge) and different country-specific versions, there are quite many releases and rereleases to be collected. I absolutely hate everything about the NES release. The cover art is quite ugly. It is all wrong, but the worst part is the game itself: I just cannot stand those horrible lame graphics. What were they thinking? I am definitely going to skip the NES release. Atari 2600 and Mattel Intellivision ports are a different story, though. Both have great cover art and the games look fantastic. I may have to reconsider these even though they are later releases. If you can help with getting either of those, please contact me via email (kalevi@kolttonen.fi). It is my main purpose to show a few 8-bit Boulder Dash releases here. The pictures are not exhaustive. I have several plastic container boxes for my retrogame collection and those storage boxes contain loads of different games and the boxes are stacked and buried inside my closet room. It is simply too much work for me to go through all those boxes and pick out all Boulder Dash games to take photos of them. On this page I will display only Boulder Dash, Boulder Dash 2, Boulder Dash 3, Boulder Dash 4 and Boulder Dash Construction Kit. 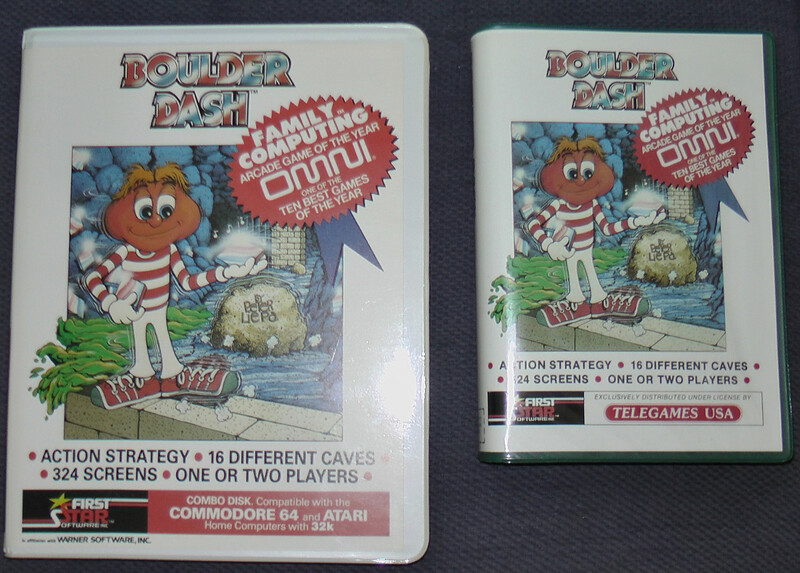 Complete set of three original 8-bit Atari 800 Boulder Dash releases, 32K RAM required to run disk and tape. The disk version is still new and sealed, extremely rare in this condition! These original tape and cartridge Atari 800 versions are rare too. This set is an amazing piece of history! Big plastic box First Star Software Atari 800/Commodore 64 combo disk release. It is very hard to find, I have only seen one on eBay during all these years. I bought this one from a friendly private collector located in USA. Colecovision cartridge release is in a very similar plastic box, but it is smaller. Both of these are very rare, but the Colecovision version is extremely rare. According to one rarity list, it could be among the six rarest Colecovision cartridges ever released excluding prototypes. Some collectors regard it as the rarest. Some claim that this Colecovision cartridge was meant to be released at the worst possible time just after the 1983-1984 "video game market crash". During that crash, the desirability of video games consoles went down because everybody wanted proper home computers with keyboards and external storage media (disk, tape) in order to program and use utility programs. It is natural that when games consoles market crashed, nobody wanted their game cartridges either. According to the information I have, Telegames never made a "real" release of this Boulder Dash cartridge. Instead, it had limited marketing in some magazines and was sold via mail order only in very limited quantities. This Colecovision cartridge is complete in a new, pristine, unused condition, it has never been played! 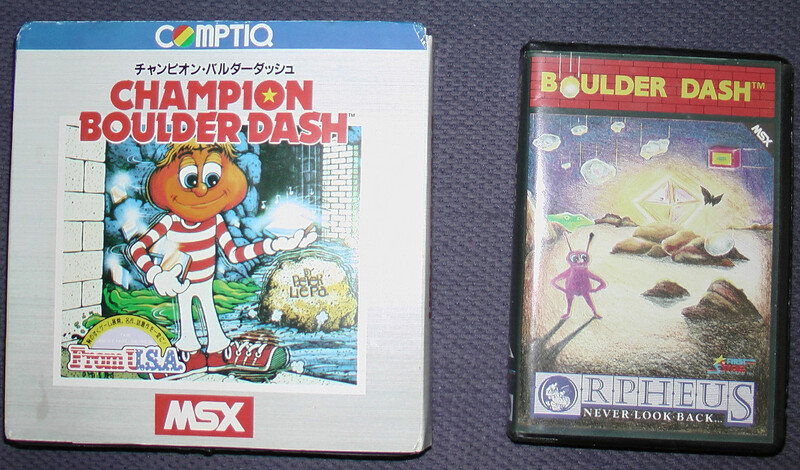 MSX Champion Boulder Dash japanese cartridge release. It is complete and quite rare. I suppose "Champion" in the title means nothing and that this is probably just the original Boulder Dash sold in the comfortable-to-use cartridge format. But I could be wrong. Orpheus Boulder Dash tape release for MSX. This is definitely the first Boulder Dash and it is pretty scarce too. Super Cassette Vision is a rare 8-bit console that was most popular in Japan although some units were sold in Europe as well. This is the complete Super Cassette Vision cartridge release and it is uncommon. 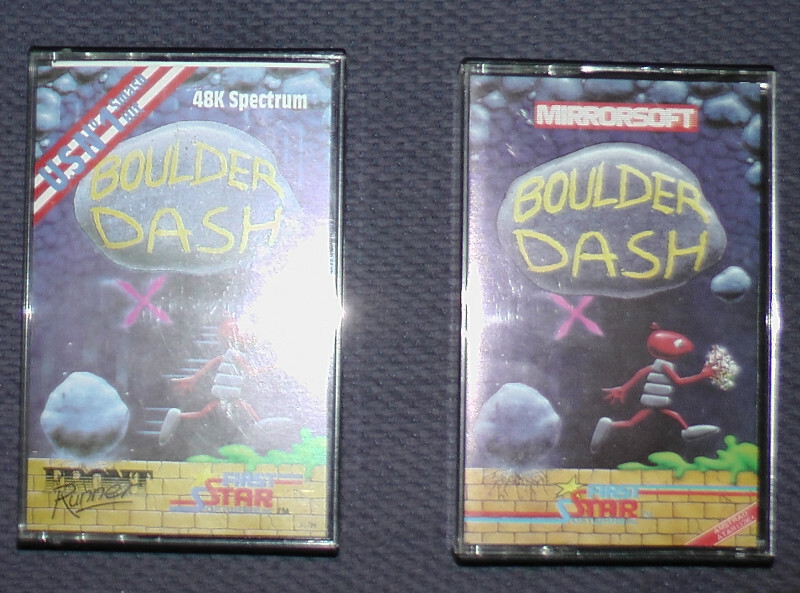 Original Sinclair ZX Spectrum and Amstrad tape releases of the first Boulder Dash. For Spectrum 48K RAM is required so the 16K computer cannot run this game. The Amstrad version is actually a double release: B-side contains Atari 800 version. My apologies for the photo being ruined by incorrect use of flash! 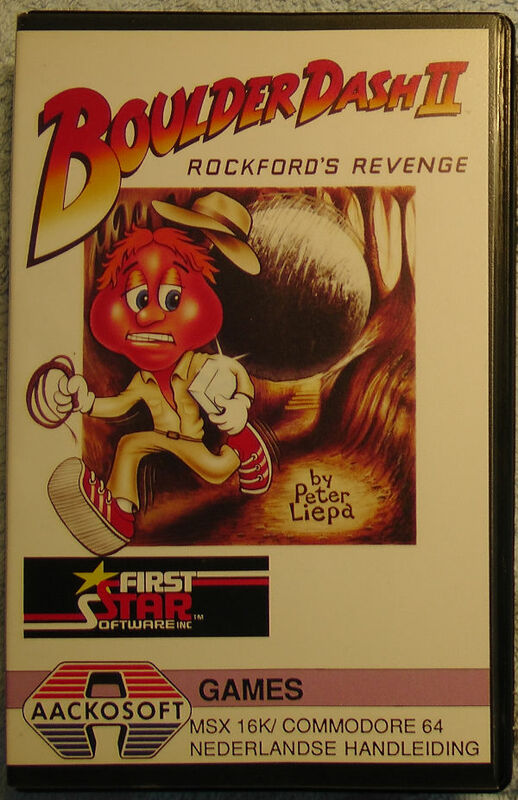 Atari 800 Boulder Dash 2 - Rockford's Revenge UK/European disk "wallet/album" version by Databyte. Rare stuff. Atari 800 Boulder Dash Construction Kit UK/European disk "wallet/album" version by Databyte. Rare stuff too. 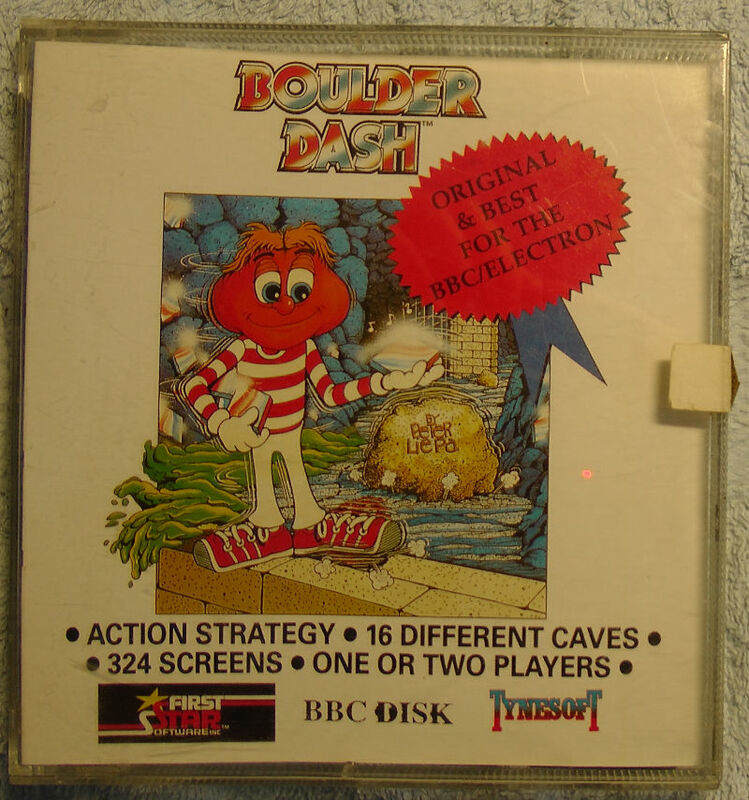 BBC Micro/Acorn Electron tape release of the original Boulder Dash. New and never been used, pretty rare. 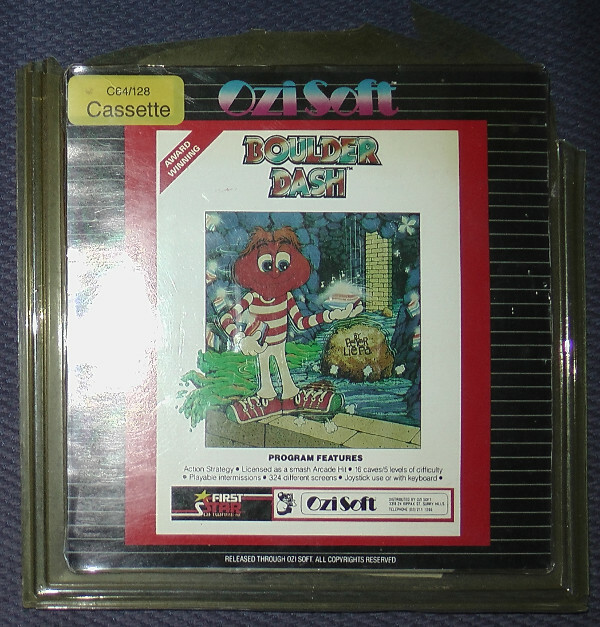 Commodore 64 Boulder Dash Construction Kit disk release by Ozisoft where "Ozi" = "Aussie" = "Australia". I have never seen another one and I am sure this must be super rare at least in Europe. 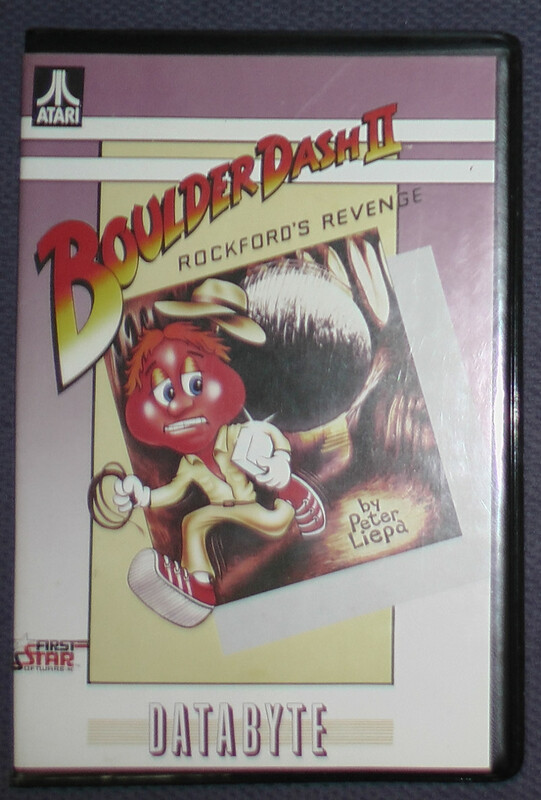 MSX Boulder Dash 2 - Rockford's Revenge spanish tape release. Rare! 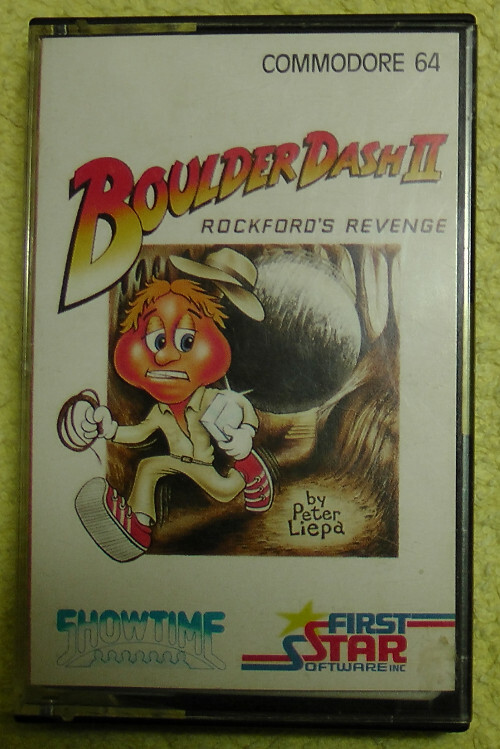 Sinclair ZX Spectrum Boulder Dash 2 - Rockford's Revenge spanish tape release. Rare! 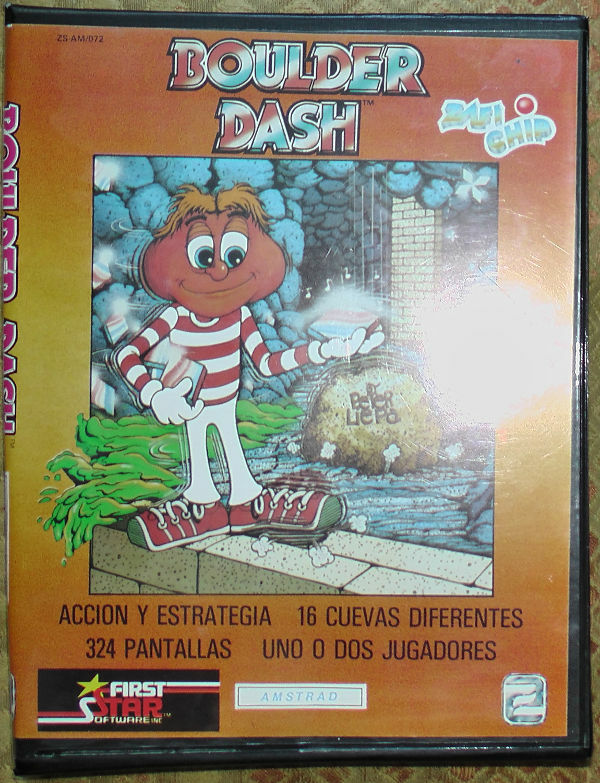 Commodore 64 Boulder Dash spanish tape release. Likewise rare! 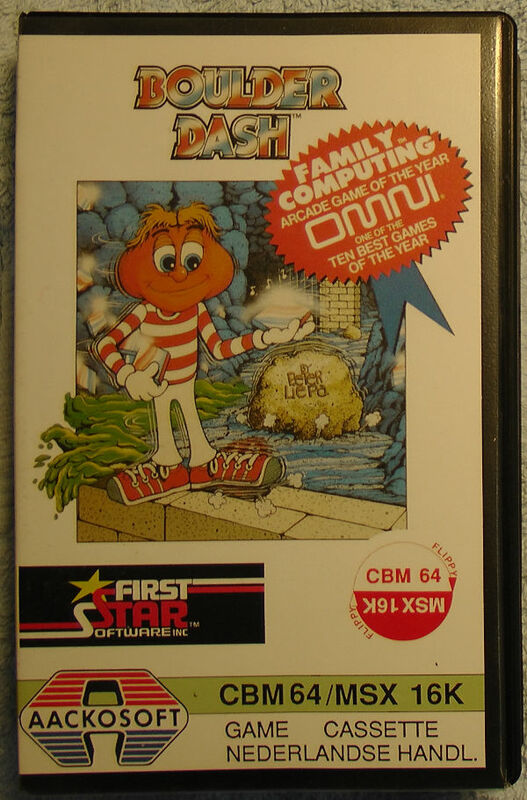 Commodore 64 Boulder Dash Ozisoft tape release. Never seen this anywhere! 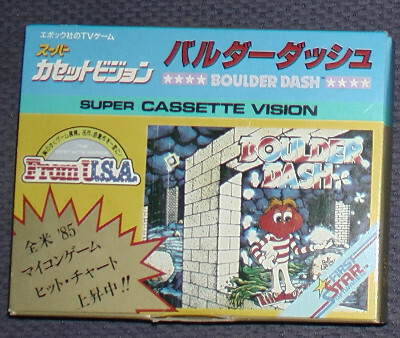 MSX Boulder Dash spanish tape release. Extremely rare! MSX Boulder Dash alternative tape release. Pretty rare! 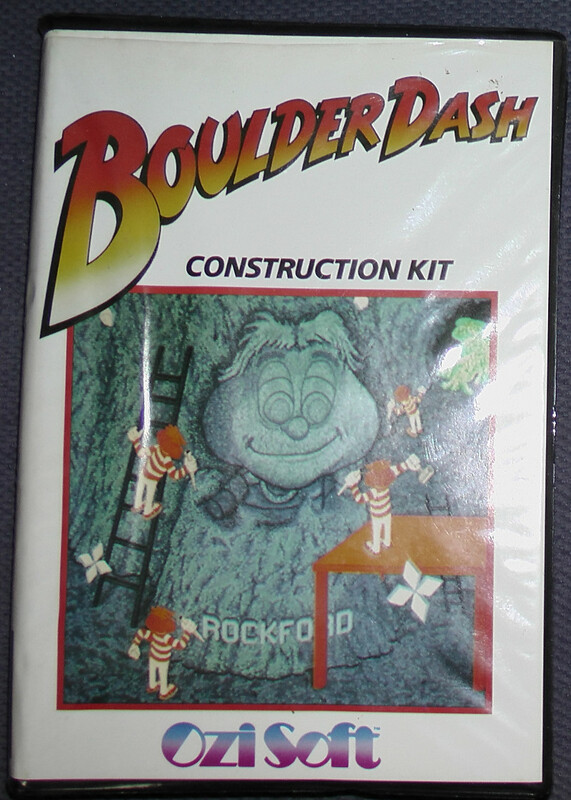 Commodore 64 Boulder Dash Construction Kit Databyte disk release. Pretty rare! 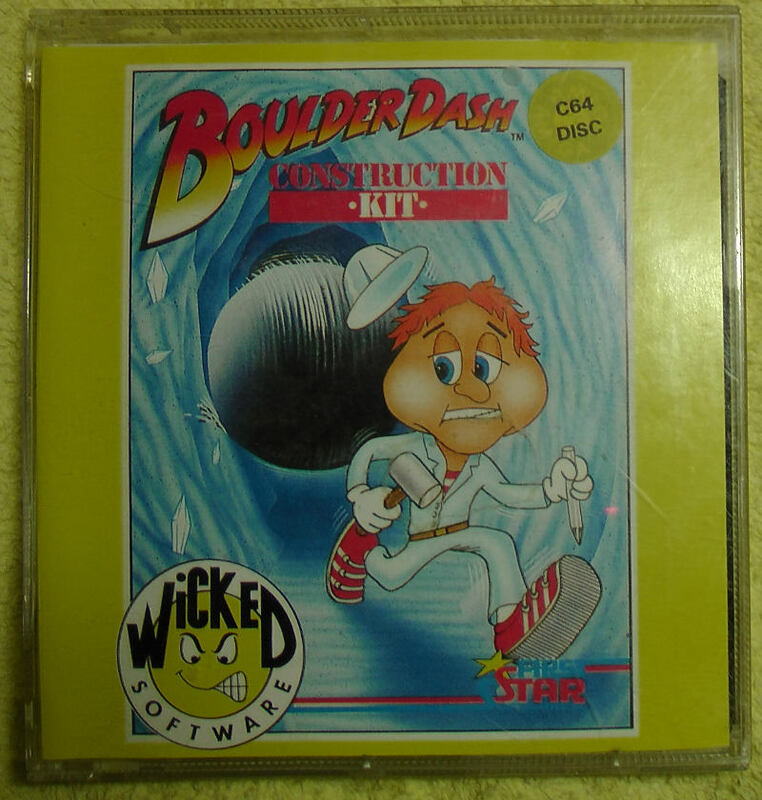 Commodore 64 Boulder Dash Construction Kit Wicked Software disk release. Very rare! 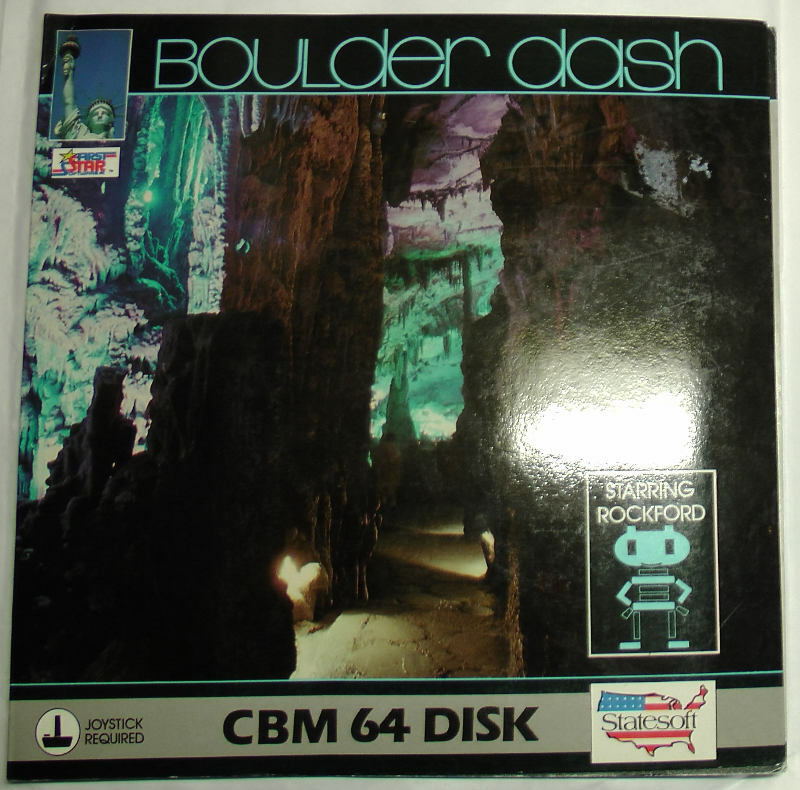 Commodore 64 Boulder Dash Microfun disk release. Very rare! Commodore 64 Boulder Dash 2 Finnish Showtime tape release. Super rare! Showtime was actually a VHS video distribution network in Finland back in the 1980s. They rented out movies, that is what their main business was all about. Not many people know that they released a few computer games, too! 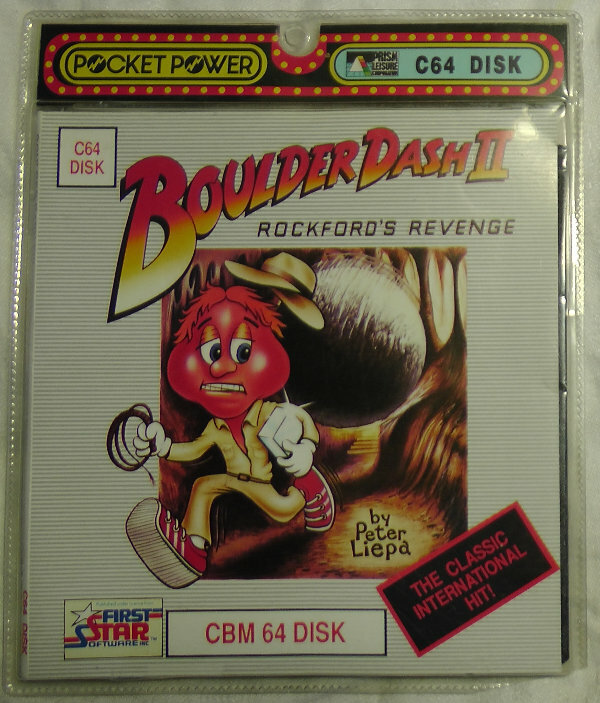 Commodore 64 Boulder Dash 3 disk release. Super rare! And what a terribly ugly game it is, oh no! Commodore 64 Boulder Dash 4 tape release. It is rare! Also contains the Boulder Dash Construction Kit. Commodore 64 Boulder Dash Prism tape release. Not so rare. Commodore 64 Boulder Dash 2 Prism tape release. Not so rare. 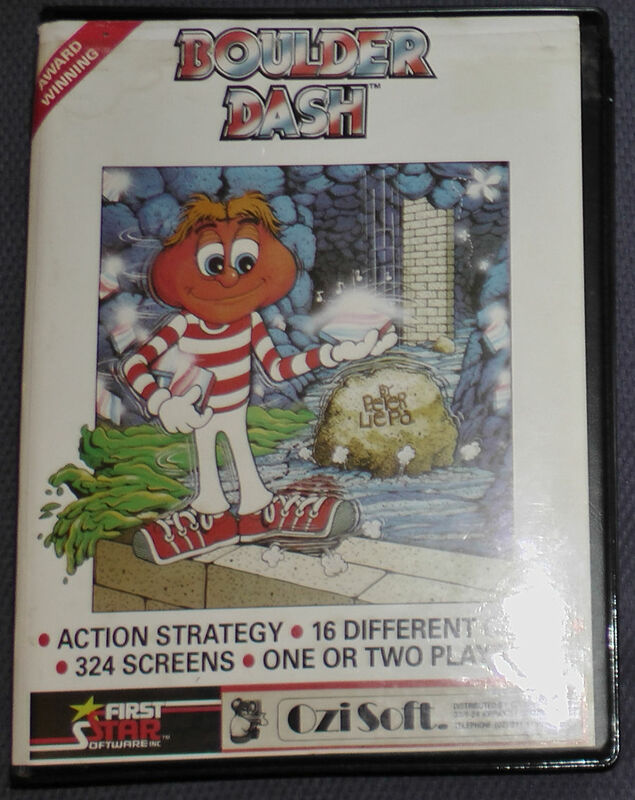 Commodore 64 Boulder Dash Ozisoft tape release. Extremely rare, at least outside Australia! I have never seen another one. This box is just huge, it is made of black plastic and it is so thick it could almost contain a VHS video tape. I cannot believe this! It is now January 3rd, 2018 and I have just received this release an hour ago. What a fantastic start to the year 2018! MSX Boulder Dash 2 Databyte tape release. Pretty rare, I guess. I don't know for sure. 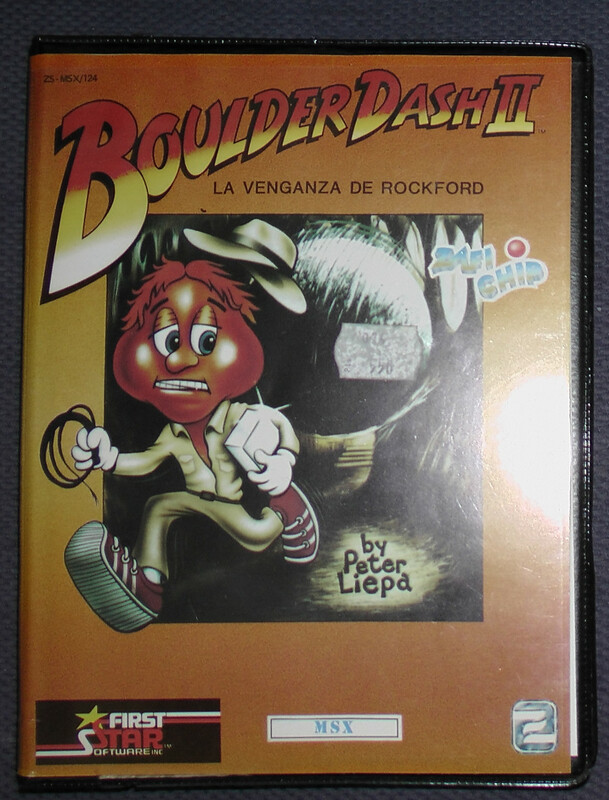 Amstrad Boulder Dash Spanish tape release. I suppose it is quite rare, I haven't seen others. 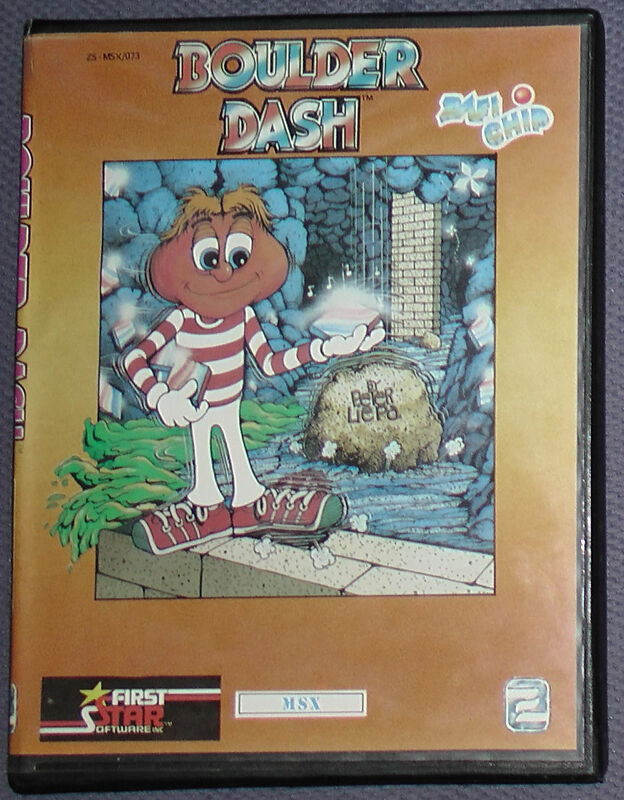 Commodore 64 Boulder Dash 2 European Prism disk release. I assume it is pretty rare. 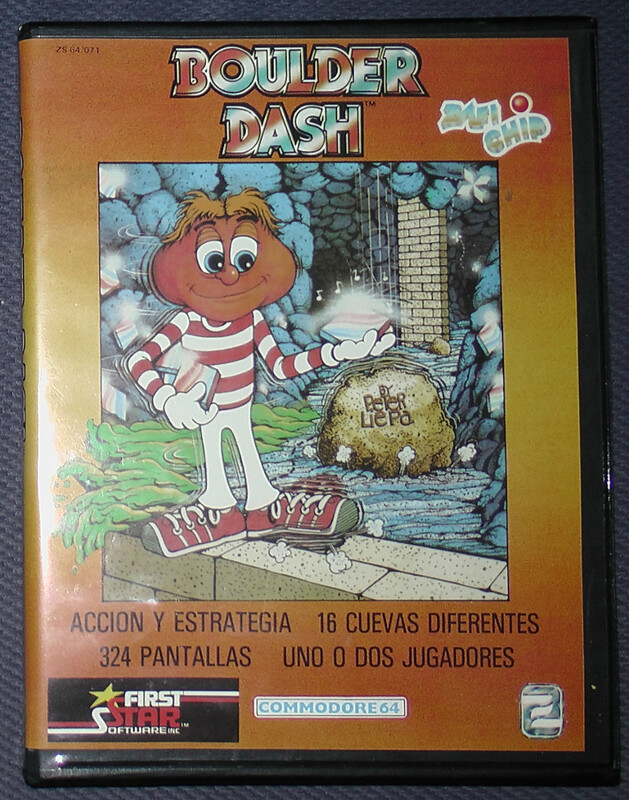 Commodore 64 Boulder Dash European Statesoft disk release. I am almost sure it is ultra rare! This sleeve is pretty huge, I am telling you! 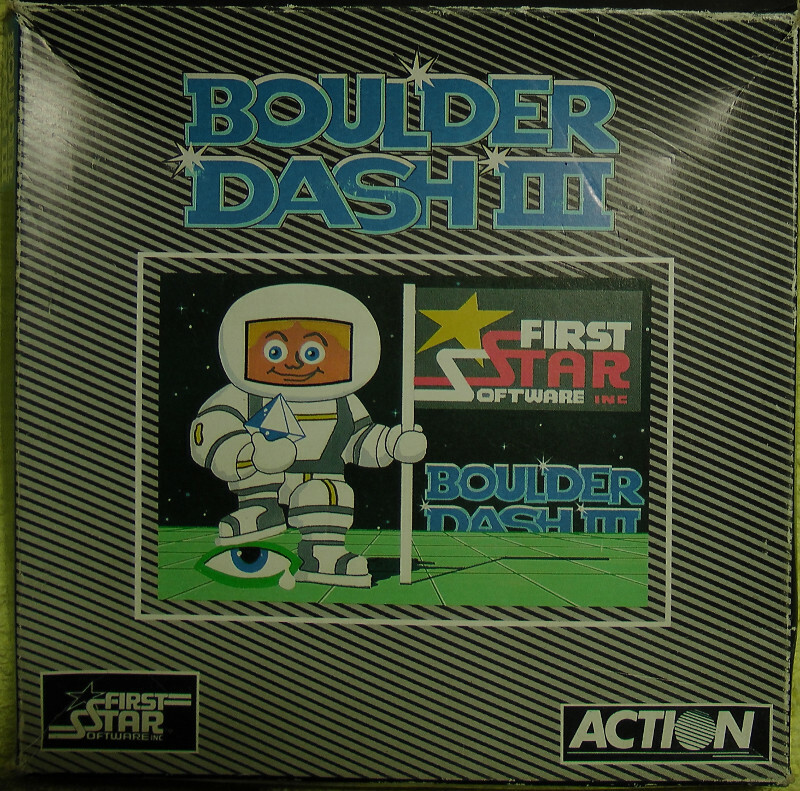 Commodore 64 Boulder Dash 3 European Action tape release. I guess this is rare! As I said earlier in this article, I do not like Boulder Dash 3 graphics at all. On the contrary, I think they are horrible. What a pity! But I still bought this tape release just as a nice addition to my collection. That is it, nothing more. 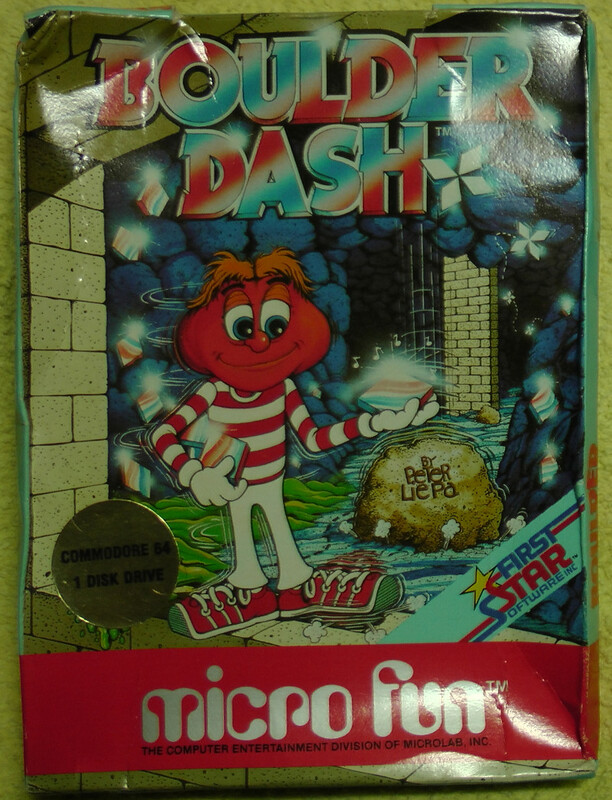 BBC Micro Boulder Dash Tynesoft floppy disk release. I am not sure about the rarity of this, but I have not seen another in a long time. 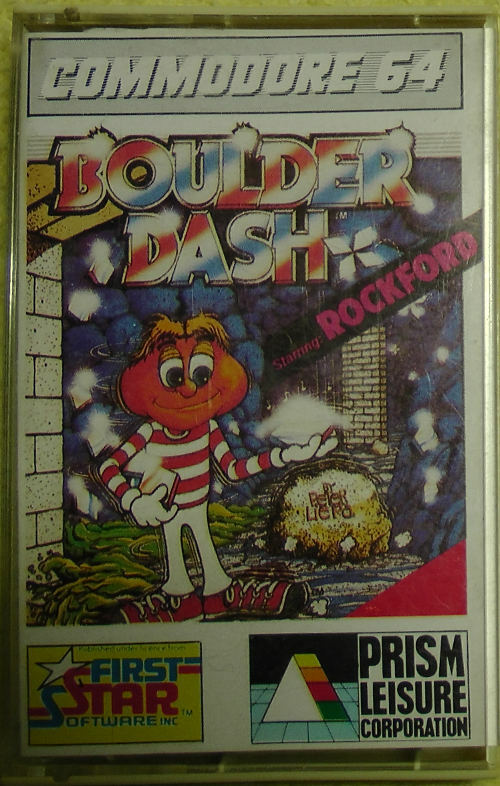 Commodore 64 and MSX Boulder Dash Dutch Aackosoft combo tape release. I guess this is rare! Commodore 64 and MSX Boulder Dash 2 Dutch Aackosoft combo tape release. I guess this is rare, too! 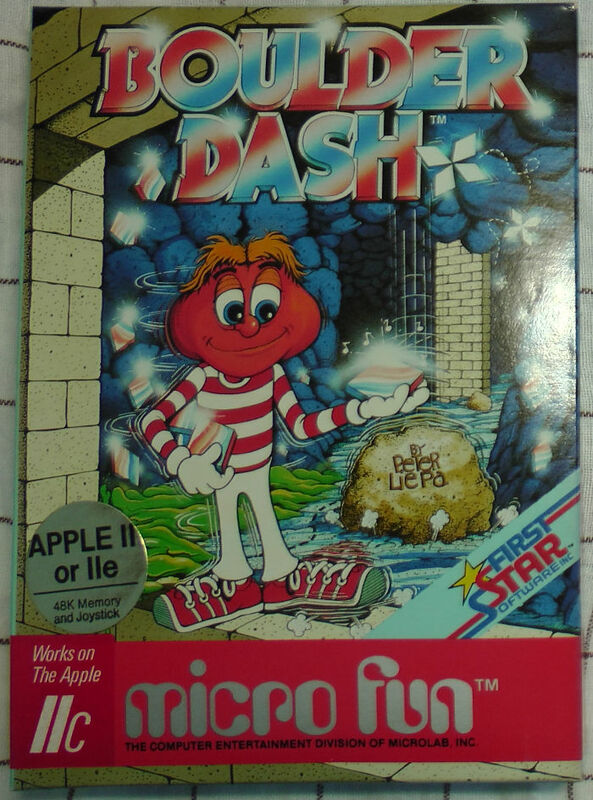 Apple 2 Boulder Dash Micro Fun disk release. Not very common at all! 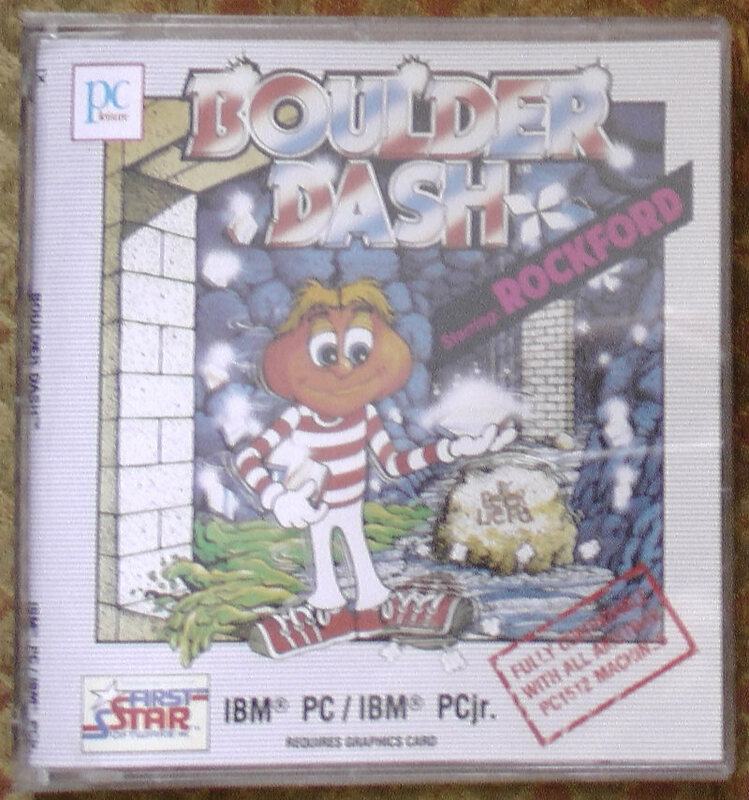 PC-8801 Boulder Dash disk release. Quite rare! PC-8801 was a popular 8-bit Z80-based computer in Japan. IBM PC and PCjr Boulder Dash disk release. It was perhaps stupid of me to buy this, because I am supposed to collect 8-bit releases only. This obviously does not fit very well here, but I decided to make an exception. Apple 2 Super Boulderdash disk release. I usually do not want these Super Boulderdash releases, because they are a two-game collection. 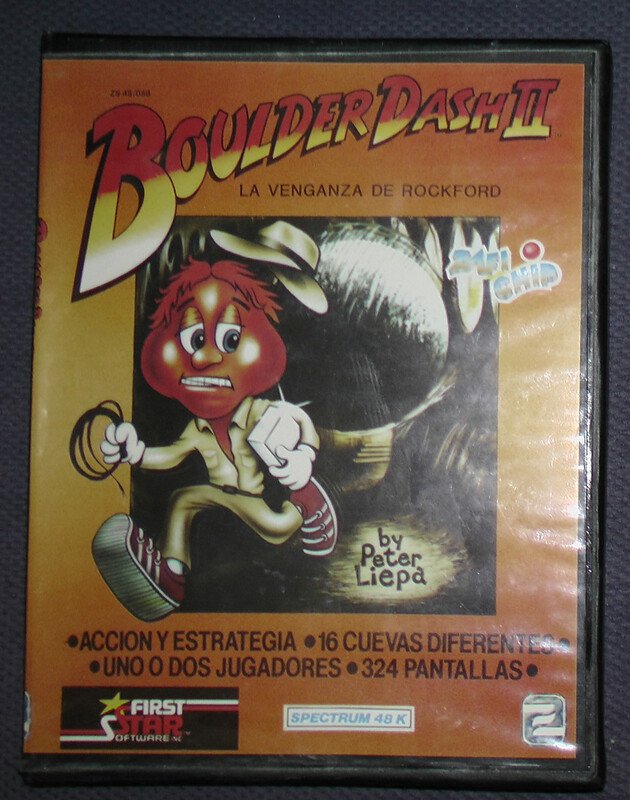 But I am guessing that Boulder Dash II was never released stand-alone for Apple 2, so that is why I bought this disk. I am not sure if it was wise, but here we go anyway. 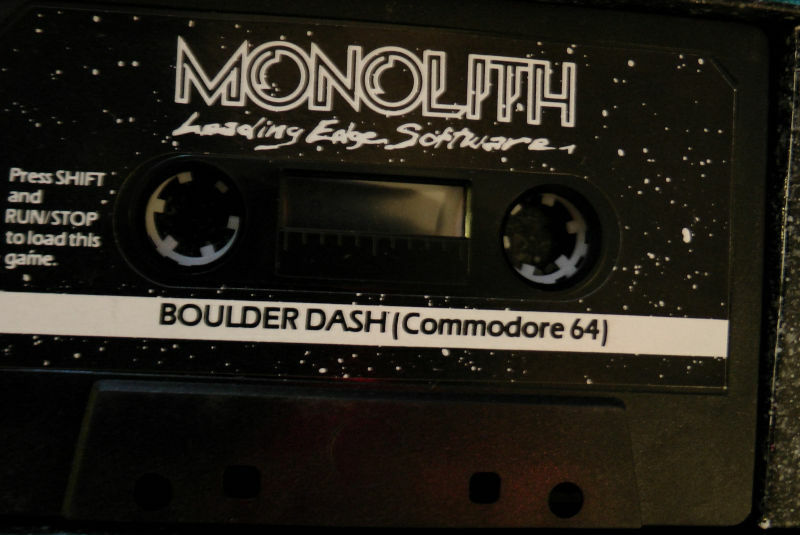 Commodore 64 Boulder Dash Monolith tape release. This thing is very weird in two ways. First, the cardboard box has a very strange shape: it is very tall and narrow. 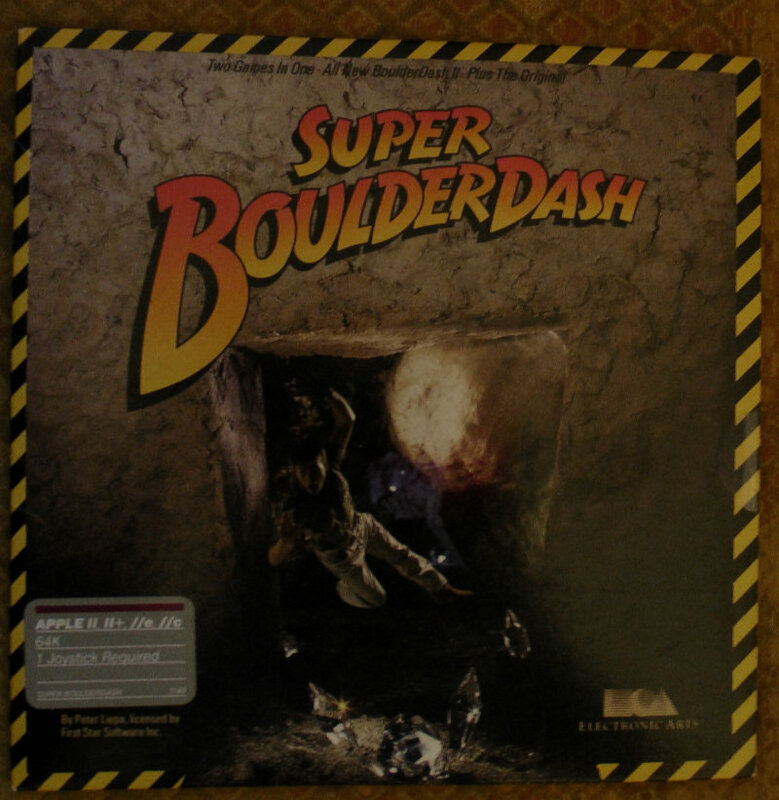 Second, it does not say "Boulder Dash" anywhere on the box. Come on, how crazy is that! A commercial C64 game box that does not tell the buyer which game it contains. That is why I have included a second photo of this release, and it is of the tape itself. Now finally we get to see that it is indeed a Boulder Dash! What about the rarity of this release? I do not know, but I suppose it is very rare.